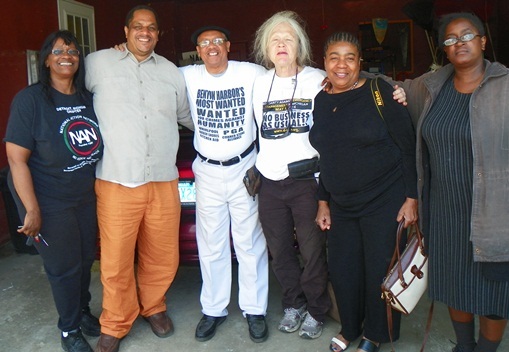 B A N C O: Diane Bukowski on Benton Harbor & Pinkney - Excellent Coverage! 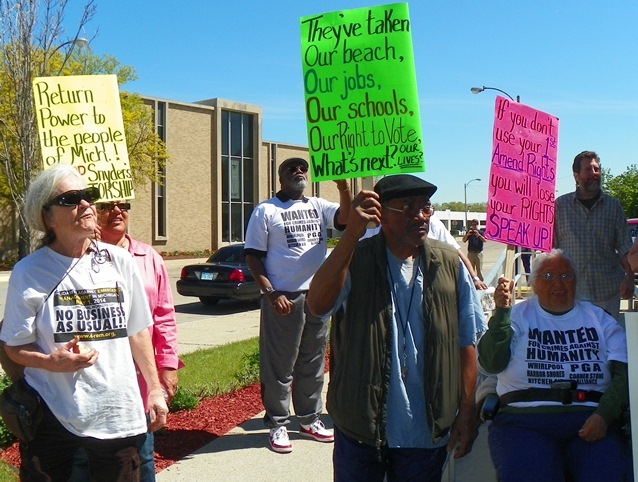 Diane Bukowski on Benton Harbor & Pinkney - Excellent Coverage! 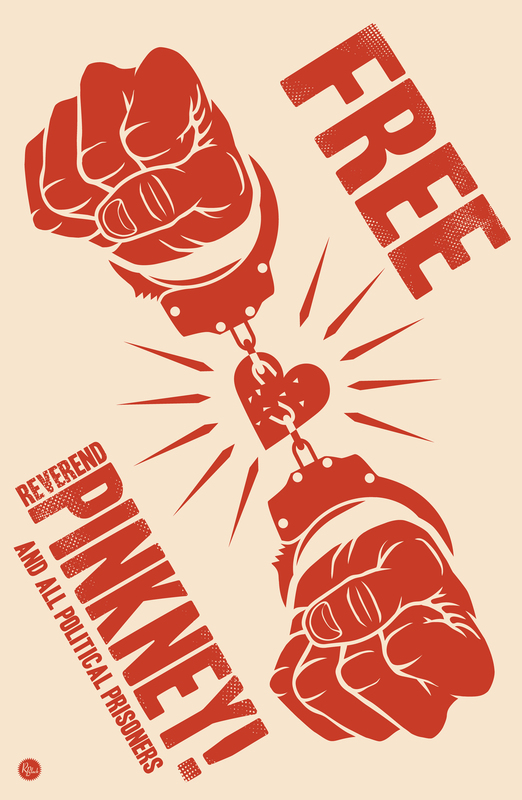 DISMISS ALL CHARGES AGAINST REV. PINKNEY; COURT FRI. MAY 30! 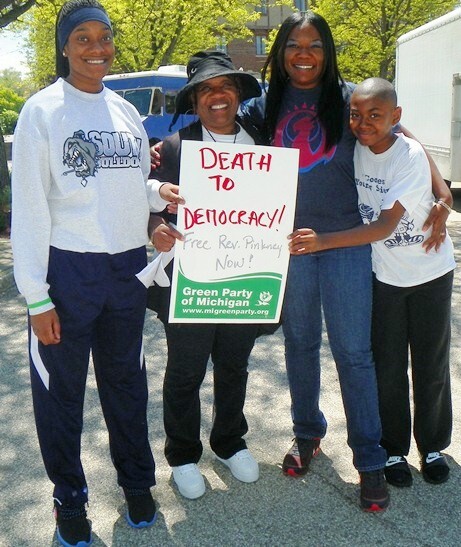 SAVE BENTON HARBOR! BOYCOTT WHIRLPOOL! Dorothy Pinkney, Rev. 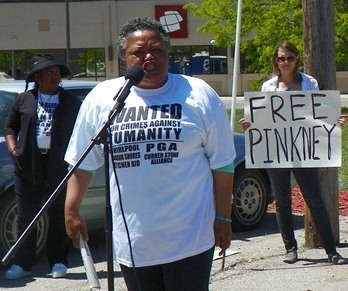 Edward Pinkney’s wife, addresses rally on Benton Harbor City Hall steps May 24, 2014. Detroiters Alma Cozart, Cornell Squires, Cindy Darrah, Marcina Cole, and Kim Green visit with Rev. Pinkney at his home after rally. 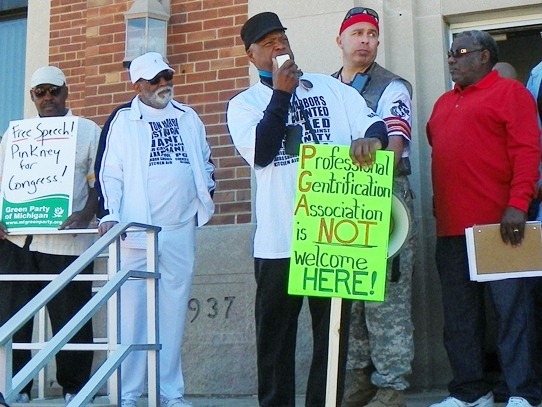 BENTON HARBOR, MI – Supporters of renowned activist Rev. 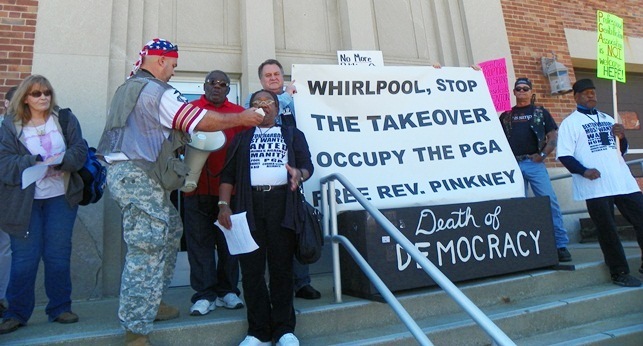 Edward Pinkney turned out from California to Indiana to Detroit to New York City for a rally and march denouncing Whirlpool’s corporate takeover of this poor, majority-Black city and ongoing state control on May 24. 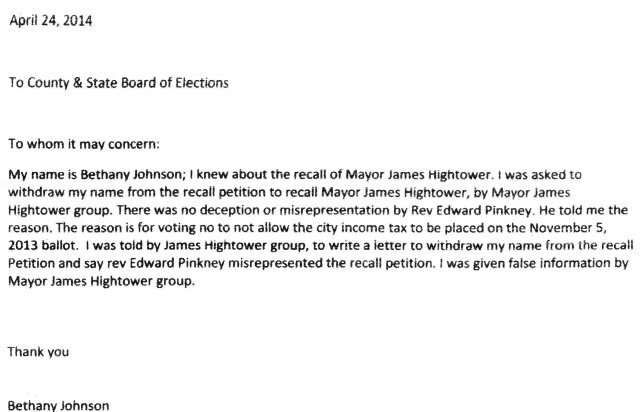 They also called for five felony and six misdemeanor charges brought against Pinkney to be dropped, related to a recall campaign against Benton Harbor Mayor James Hightower, a Whirlpool ally. Pinkney faces a preliminary exam on these charges before Judge Sterling R. Shrock, Fri. May 30 at 8:30 a.m. in the Berrien County Courthouse, located at 811 Port Street, St. Joseph, MI 49085. The charges, which his supporters and court files indicate are patently groundless and violate Pinkney’s First and 14th Amendment rights, are to be heard in one of the most racist court systems in the country. Each felony count carries a maximum penalty of five years in prison. Marchers circulate through Benton Harbor’s gentrified downtown. Dorothy Pinkney’s daughters and grandson traveled from Columbus, Ohio for the event. By electronic hook-up, Pinkney himself addressed the rally. “We must get rid of this corrupt system and prove I am innocent of all charges,” Pinkney said. “The Mayor hooked up these charges; we must tear James Hightower down and show what we are capable of doing. LET’S FIGHT BACK! LET’S FIGHT BACK! The Harbor Shores Development, sponsored largely by Whirlpool, includes the Jack Nicklaus Golf Course, where a national PGA tournament was taking place May 24, a luxury housing development, and other development of land adjacent to the beautiful Lake Michigan beach that is part of the public Jean Klock Park. 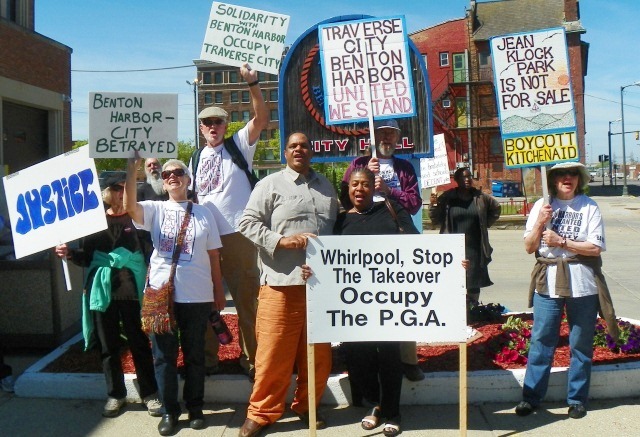 The Black Autonomy Network (BANCO), the Green Party, and numerous other organizations are calling for a boycott of Whirlpool products, marketed under the brand names of Whirlpool, Maytag, KitchenAid, Jenn-Air, Amana, Brastemp, Consul, Bauknechtand others. 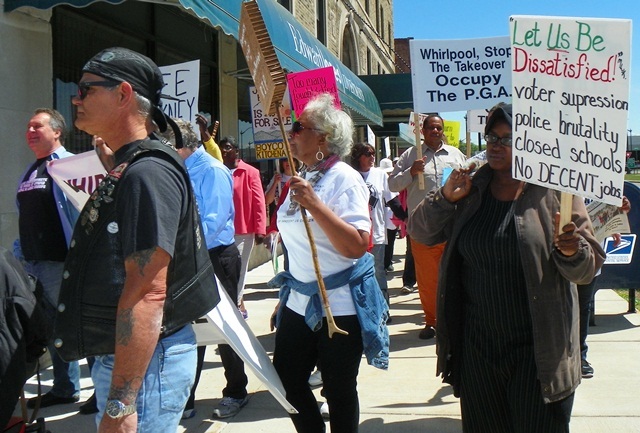 The petition to recall Mayor Hightower was initiated after he refused to authorize a city income tax that would have garnered substantial income from Whirlpool, which pays no city taxes despite the fact that it raked in $19 billion in sales in 2013. 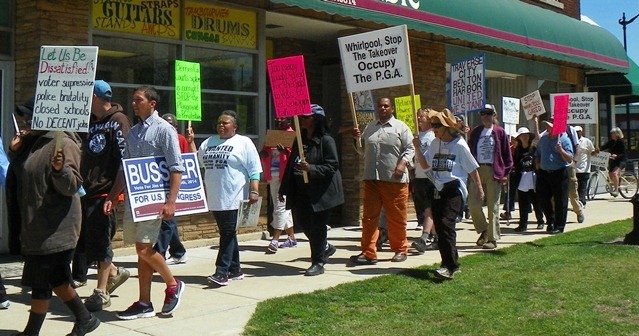 Pinkney supporters march down Main St. in Benton Harbor May 24. According to a Court Complaint, Juan Mata of the Sheriff’s Department brought felony charges against Pinkney of “election law forgery” and misdemeanor charges of “Election Law False Cert Circulatory,” prior to a massive inter-agency SWAT raid on Pinkney’s home April 25. Pinkney and his wife had left to celebrate her birthday, but Pinkney with his lawyer Tat Parish turned himself in the following day. Ralph Poynter of NYC speaks at rally. Judge Shrock placed Pinkney under house arrest after his arraignment, even though he posted a $30,000 10 percent bond. He forbade Pinkney from using his computer and forced him to wear a tether to track his movements within his house. 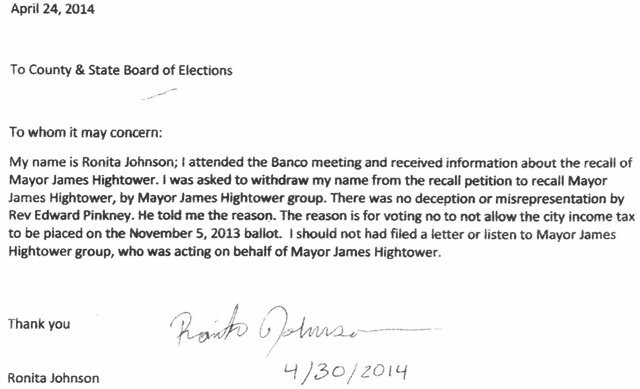 In a letter asking for a criminal complaint against Mayor Hightower and one Ron Johnson, dated May 6, 2015, Pinkney told the U.S. Justice Department that the Sheriffs went to the homes of petition signers and circulators to intimidate and interrogate them at length and in great detail on a massive level. Such activity against petition signers has not seen since the McCarthy era of the 1940’s and ’50’s. Ralliers came from all over Michigan, including Traverse City and Detroit. “This complaint against the two above-named parties is based upon action to obstruct justice and the Democratic process by 1) thwarting, circumventing and blocking the previously scheduled May 6, 2014 Benton Harbor voting mayoral recall election; 2) conspiring, manufactur[ing], and present[ing] false information in order to impede . . . the recall process and 3) to have directly or indirectly utilized the auspices and/or Office of the Mayor of Benton Harbor, Michigan and the Berrien County Sheriff Department to harass, intimidate and or otherwise impede Benton Harbor voters . . .” Pinkney said in his complaint. Four voters submitted identically-worded affidavits asking for their signatures to be removed but several later recanted. Bethany Johnson and Ronita Johnson signed affidavits as below (their addresses and signatures, which were below addresses, have been cut out). 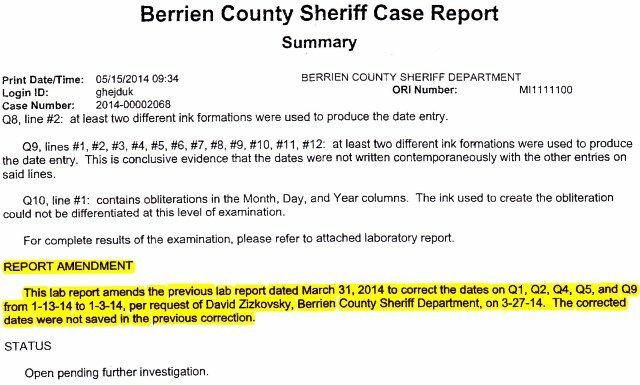 Non-expert Sheriff’s Department deputies, who claimed they found date changes and duplicate signatures on the petitions, selected only 10 of 62 petitions submitted to Berrien County Clerk Sharon Tyler to send to the Michigan State Police Crime Lab’s Questioned Documents Unit. Tyler earlier certified the majority of the petitions and ordered the recall vote. Only five of the 10 petitions were circulated by Pinkney, although he circulated a total of 34 petitions; the others were not questioned. The Sheriff’s case report shows absolutely no proof of Pinkney’s involvement in any alterations of dates (allegedly proved by the use of “different ink formulations,”) or clearly accidental duplicate signings by several voters. Pinkney never had sole possession of the petitions. His co-defendant, James Cornelius, who has been charged with one misdemeanor count, turned them in to the Clerk’s office because the office would not accept them from Pinkney, since he lives in Benton Harbor Township. Pinkney said another woman was in charge of the petition gathering process. In fact, the only admission of alteration of dates on the petitions came from the Sheriff’s Department itself, which caused the Michigan State Police Crime Lab to alter dates on five of the petitions. See Page 13 below. A recent study by the National Academy of Sciences (NAS) showed that most crime labs rely on outdated, unscientific assumptions and methodology, and called for all crime labs to be separated from law enforcement. “Forensic scientists who sit administratively in law enforcement agencies or prosecutor’s offices, or who are hired by these units, are subject to a general risk of bias,” the Feb. 18, 2009 NAS report said. “The potential for conflicts of interest between the needs of law enforcement and the broader needs of forensic science are too great.” The report called for the creation of an independent National Institute of Forensics Sciences, which would conduct scientific research, set national standards, and certify, regulate, enforce and standardize forensic testing and testimony. 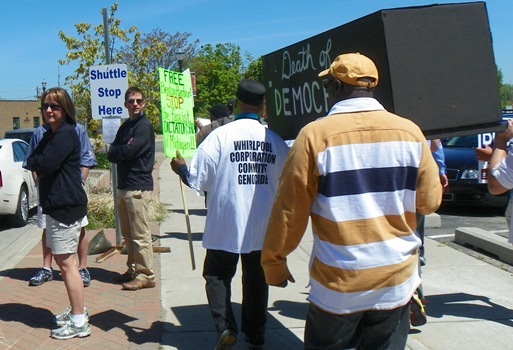 PGA goers at shuttle stop watch coffin “Death of Democracy” pass by during march. Hightower earlier threatened former Berrien County Commissioner Dennis Knowles about the recall campaign. He told him during a phone conversation that he “got a call from Lansing from two people” regarding a resolution passed by the Commission, which has been upset about the Berrien County Sheriff’s Department’s massive intimidation and interrogation of petition signers at their homes, reminiscent of the McCarthy era. James Hightower’s car between two Detroit cars going to visit Rev. Pinkney at his home. Hightower may have been spying on the demonstration, since his car was driving directly in front of protesters from the Detroit delegation on the way to visit Pinkney at his home. It turned off into the Mayor’s palatial digs, however. 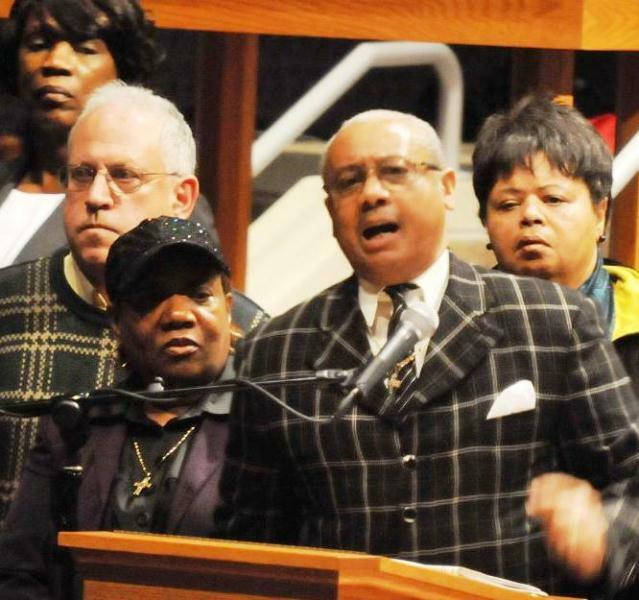 Other speakers at the rally decried the ongoing assault on Benton Harbor, the first city in Michigan to fall victim to Public Act 4, the Emergency Manager law, before its repeal in Nov. 2o13, and on its chief advocate, Rev. Pinkney. Benton Harbor no longer has an EM, but is still under state control under provisions of Public Act 436, the illegitimate successor to PA 4, passed in the dead of night by less than a two-thirds quorum of the Michigan legislature. Rev. Charles Taylor of South Bend, Ind. Rev. Charles Taylor, of People United for Better Government in South Bend, Indiana said they planned to rally the following day in their community against rampant police brutality. Monica Patrick of Detroit speaks. 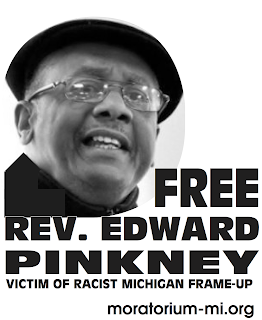 Pinkney was also falsely charged with several counts of election fraud on that occasion, for which he spent time in the Michigan Department of Corrections before his sentence was reduced to probation. A massive campaign on his behalf was conducted across the country. U.S. Rep. John Conyers at forum on Detroit bankruptcy last year. 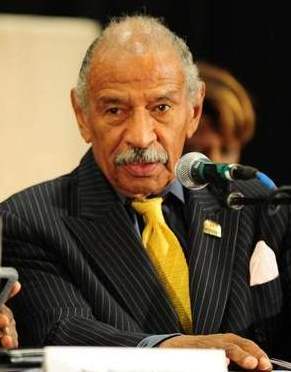 The charges against Pinkney are being pursued on the heels of two recent U.S. District and Michigan Supreme Court decisions which held that elections laws must be interpreted in the manner that is in the best interest of the public and its First and Fourteenth Amendment rights.Regarding challenges to U.S. Rep. John Conyers’ placement on the ballot because several petition circulators were alleged not to be registered voters in the district, U.S. District Court Judge Hon. Matthew F. Leitman ordered him placed on the ballot May 23. Leitman held the Registration Statute to be unconstitutional based on U.S. Supreme Court rulings and also on the Michigan legislature’s own amendment of state law allowing out-of-state residents to circulate petitions. Rev. 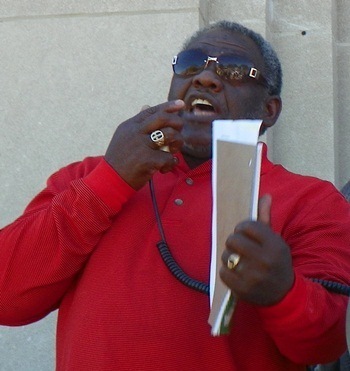 Pinkney speaks at first rally against Public Act 4 in Detroit in Jan. 2011. His wife Dorothy is at his right. 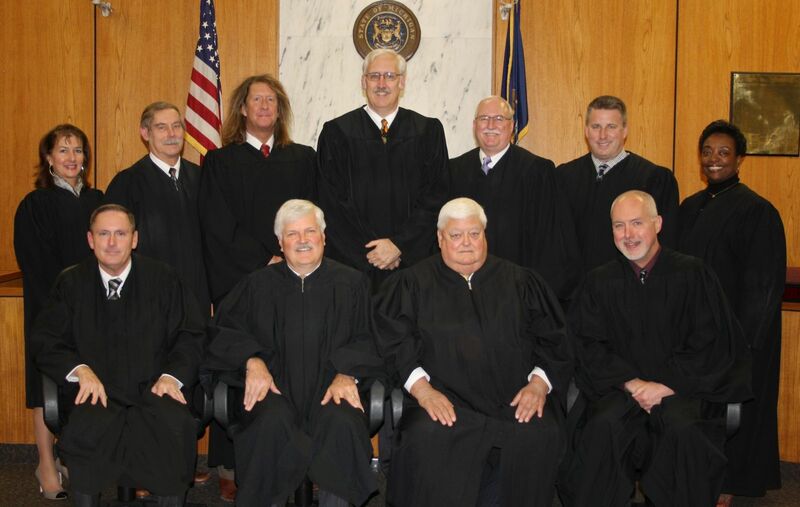 In an Aug. 3, 2012 decision, the Michigan Supreme Court held that petitions containing the signatures of over 240,000 Michigan voters calling for a referendum vote on Public Act 4, the Emergency Manager act of 2011, were acceptable despite clearly picayune contentions by opponents relating to the type font and size on the petitions. The MSC ordered the PA 4 referendum on the ballot. Over 53 percent of Michigan voters, a total of 79 out of 83 counties, voted to repeal Public Act 4. One of the key contentions by Public Act 4 opponents was that it violated the U.S. Voting Rights Act and the 14th Amendment by barring voters in predominantly Black Michigan cities from voting for municipal and school district officials who would have the power to carry out their duties without the interference of a state-appointed Emergency Manager. Benton Harbor was the first Michigan city to fall victim to PA 4. Hon. John M. Donahue, Hon. Arthur J. Cotter, Hon. Sterling R. Schrock (Pinkney’s criminal judge)Hon. Charles T. LaSata, Hon. Mabel J. Mayfield. Berrien County is renowned for its racist court system, which incarcerates more African-Americans proportionately than any other county in Michigan. Contact Rev. Pinkney at 269-925-0001; BANCO website is at www.BHBANCO.org. Call in to his internet radio talk show, which is being hosted by others for the time being, on Sundays at 5 p.m. at 347-994-3644.